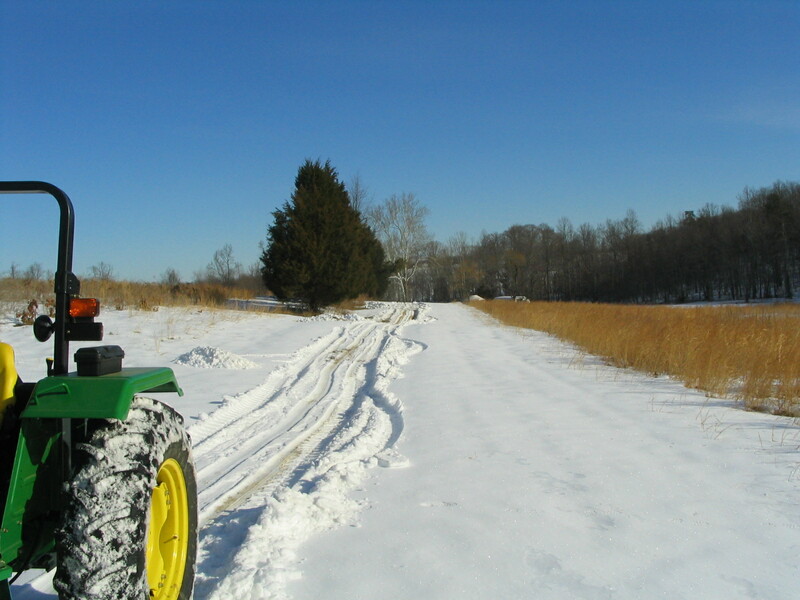 With all the snow, Gavin’s had a time trying to get things done on the farm these past few months. After the plumber came in January and put in all the water lines it snowed again. Gavin had to use the bucket on the tractor to scrape some snow off the driveway before the plumber could drive in to finish the job. As you can see, it was quite a messy proposition. 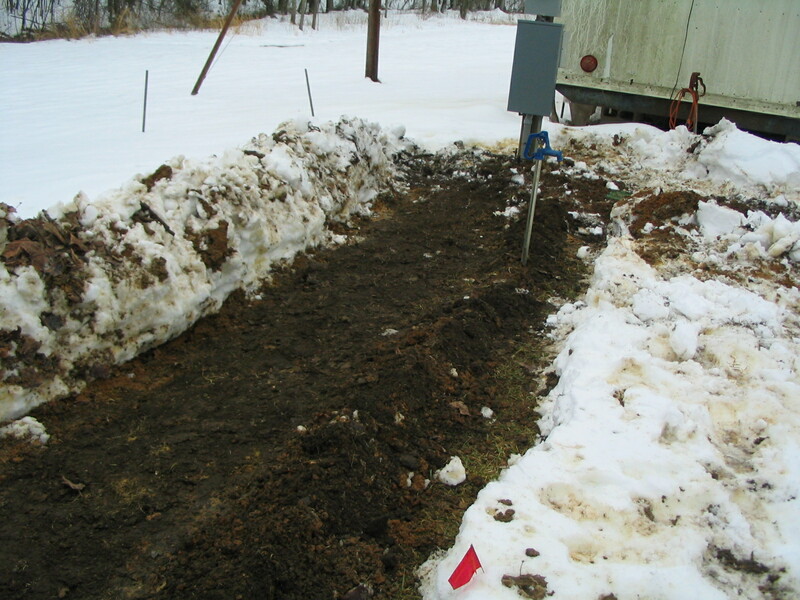 The snow had to be shoveled out of the trenches and off of the dirt piles before the work could commence. Finally, the 24″ deep trench which contains the water and electric lines is covered. Here it is, the long-awaited running water. 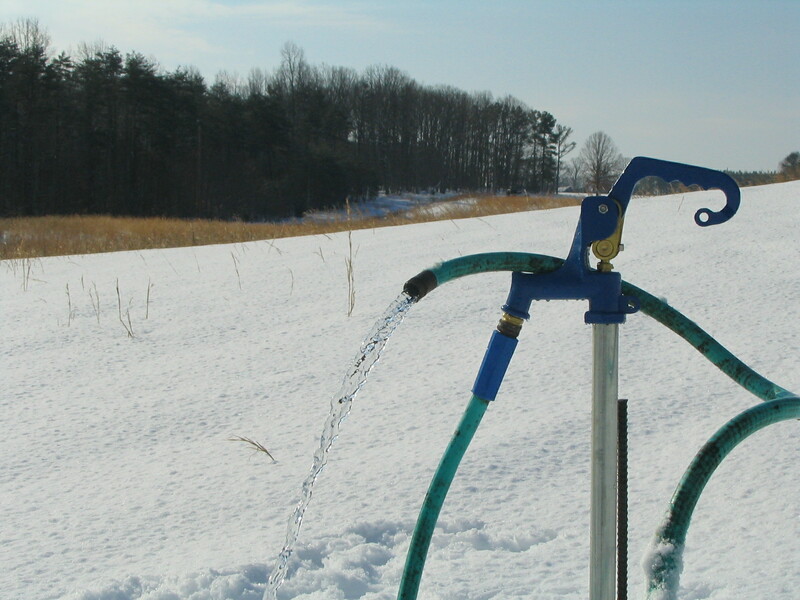 We have 5 of these blue hydrants now: one by the yurt, one in the greenhouse, and three in the fields. Still no running water in the yurt yet. 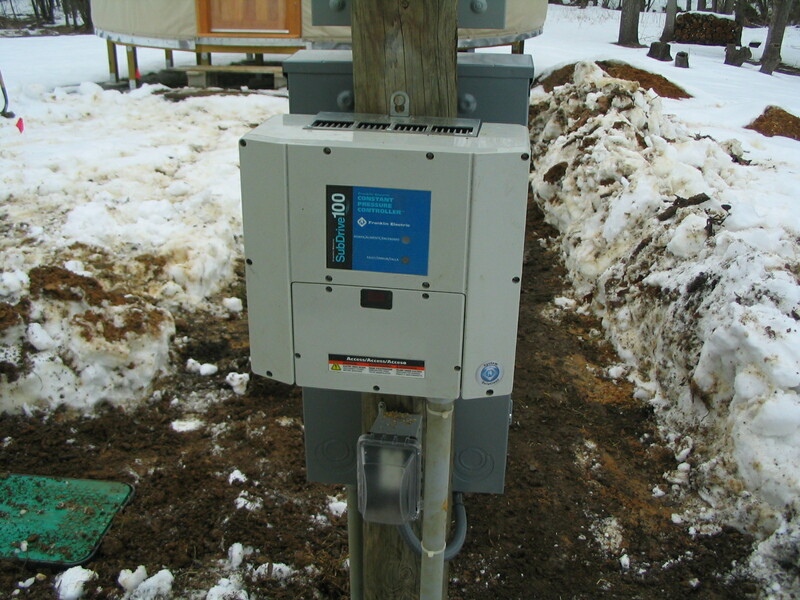 Gavin will be working on the potable water plumbing this weekend. Gavin let the water run continuously for most of a day to flush the chlorine out of the system. 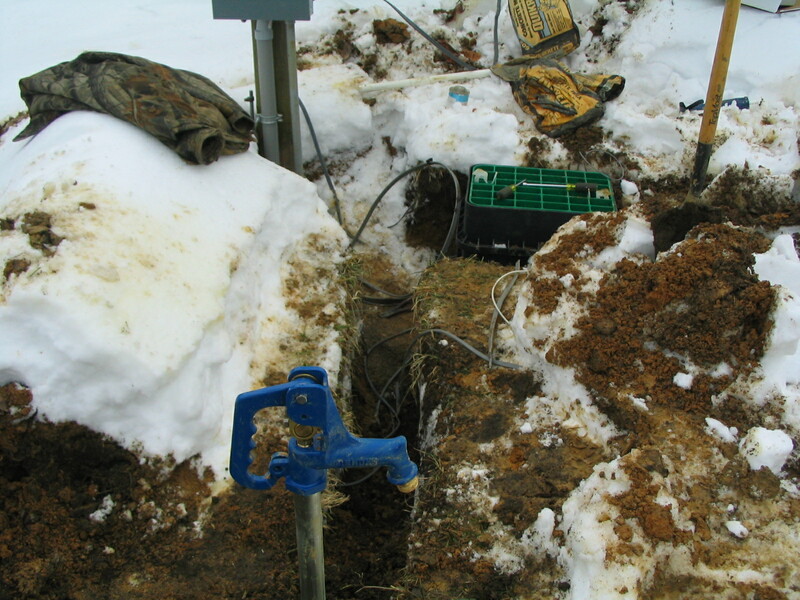 Chlorine was added by both the well-driller and the plumber to sanitize the well. He brought back several jugs of the water. It is clear, without sediment, doesn’t have an odor, and tastes like a mountain stream! 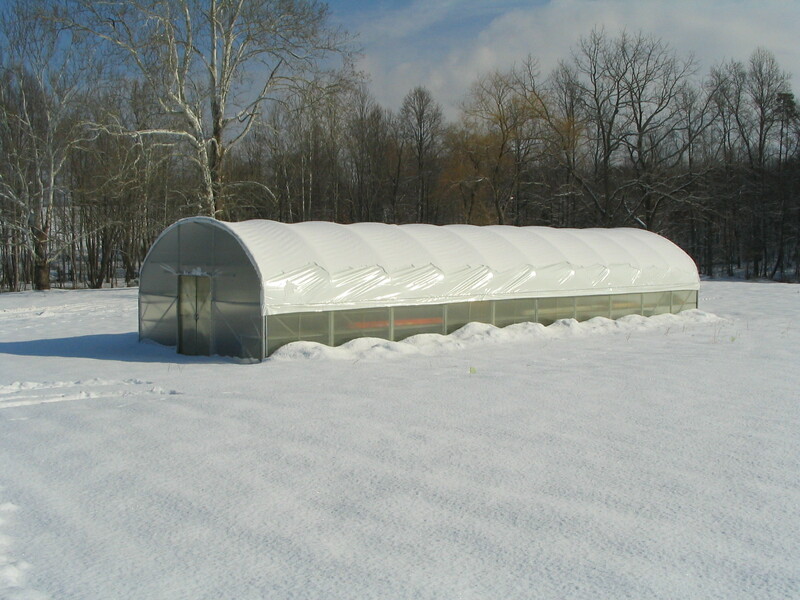 Snow can be a disaster for greenhouses, but luckily ours stood up to the weather. It has a pretty beefy structure. You can see the snow piles that slid off along the sidewall, and some snow still on the roof. We are using Dow’s SafeTouch R19 to insulate the floor. This is basically a batt insulation that is made out of spun plastic instead of fiberglass. It is a joy to work with because you don’t have to wear the protection you need when using fiberglass batts; nor does it contain formaldehyde, other binders, or flame retarders. Underneath the yurt you can see some plastic sheeting hanging down. Gavin is stapling this up across the 4′ cavities so that the insulation batts will stay up while he screws up the plywood panels. In standard construction the batts would fit tight in a 16″ on-center stud cavity and you wouldn’t have this challenge. And here is the work Gavin completed this past weekend for the sewage and waste drain pipe system. It is underneath the yurt and will all be buried, except for the cleanouts. 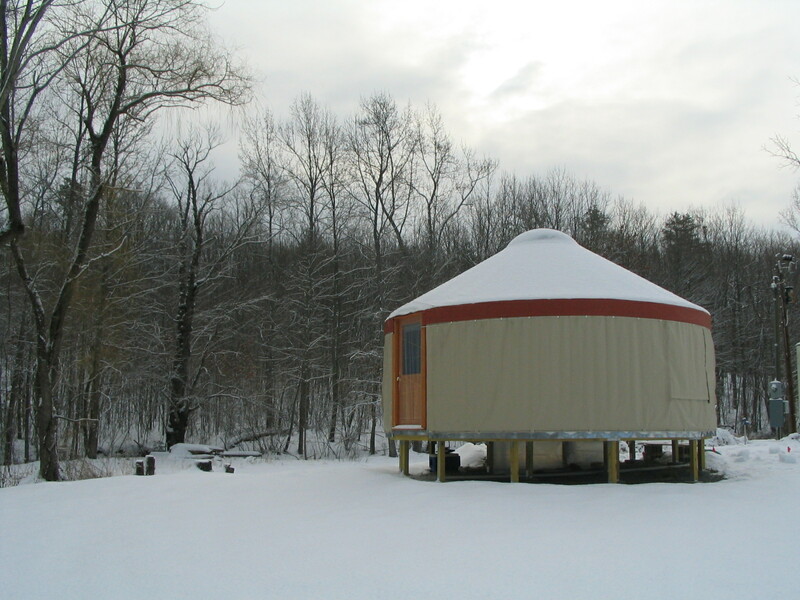 The vertical pipes connect to the fixtures inside the yurt: the toilet, washing machine, kitchen sink, bathroom sink, and shower. 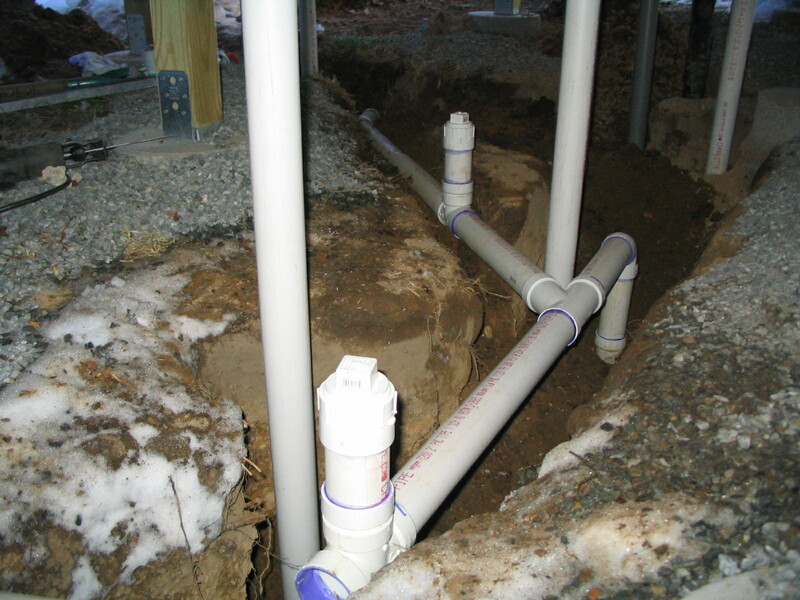 The horizontal pipes you see are actually part of the vent system. The pipes carrying the sewage are actually buried about a foot below the vent pipes so they will be protected from freezing. I truely enjoyed my short visit with you and Gavin last Sunday. Your Blog is incredable – not the mention the farm. You do not yet know what an inspiration the both of you are to people who never take on trying to build their dream. I am behind what you are doing 100%. Keep up the great work.